This storywas updated at 2:00 p.m. EDT. Threeastronauts on the International Space Station are set to return to Earth tonight(Sept. 24) ? a full day late - but not because of problems with their Soyuzlanding capsule. It was a set of stuck hooks on the station that thwarted theirfirst homecoming attempt. But how didthe unprecedented undocking glitch happen in the first place? Russian engineersnarrowed the list of electronic suspects to a faulty microswitch that may havecaused an open circuit in the docking port's wiring. At the coreof the malfunction is a set of hooks and latches on the space station's RussianPoisk docking port, which refused to release the astronauts' Soyuz capsulelast night. The glitchwas fixed overnight and the astronauts will try to leave the space stationagain tonight at 10:02 p.m. EDT (0200 GMT) and landearly Saturday on the steppes of Kazakhstan in Central Asia. Themicroswitch issue popped up early in Thursday night's undocking preparationswhen astronauts had trouble confirming the hatch between the Soyuzcapsule and space station had a tight seal. After extended leak checks, however,the astronauts pressed ahead with their undocking plans. "Basically,two sets of hooks close around each other in a docking interface," NASAspokesman Rob Navias told SPACE.com. "Last night, the microswitchindicator was not providing any feedback that it was receiving electricalcontinuity through the circuitry." This was thesame component that had trouble confirming the seal between the Soyuz capsuleand Poisk module, Navias said. At the moment, engineers are unsure if the twohiccups are related. "It'spossible," Navias said. "It's not conclusive at this point but thedata certainly point to a similar issue that would lead back to that microswitchindicator." The glitchcaused hours of delays and, eventually, forced Mission Control and theastronauts to scrap undocking and landing plans for a day. 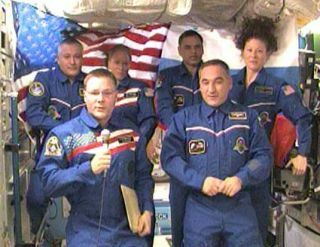 The Soyuz crew ?NASA astronautTracy Caldwell Dyson and Russian cosmonauts Alexander Skvortsov and MikhailKornienko ? returned inside the space station, and 12 Russian recoveryhelicopters awaiting their landing in Kazakhstan went back to their homeairfields. Overnight,the space station crew rigged up cables to fix the docking port to allowtonight's Soyuz departure. This will bethe first undocking conducted at the Poisk module, so Russian engineers will beclosely analyzing the problem, Navias said. The Poisk module will also be thesame port that the next trio of space station crewmembers arrive at on Oct. 10. "Thecurrent plan is to keep these jumper cables in place, so that there is acommanding path that is assured to reclose the hooks after the new Soyuzarrives at the station on October 10," Navias explained. "They'llbring up some spare parts and do some troubleshooting so that this problem isalleviated in the future." While tryingto identify the cause of the docking problem, Russian cosmonaut FyodorYurchikhin found a small star-shaped gear with two broken teeth, though it wasunclear what role the broken part may have played, if any, in the evening'stroubles. Yurchikhinand two NASA astronauts ? Douglas Wheelock and Shannon Walker ? are remainingbehind on the International Space Station to complete their own space missionlater this year. NASA willbroadcast the upcoming Soyuz spacecraft undocking and landing live on NASA TV.